Contrary to public opinion – periodontal or gum disease is the primary cause of tooth loss, not tooth decay. The persistent presence of chronic oral infections has been associated with the onset of other diseases and is subject to ongoing research. 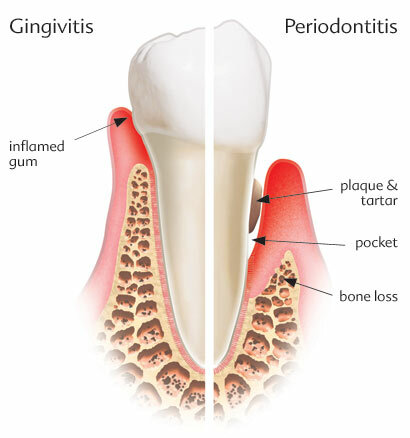 Periodontal disease is an inflammatory disease of the supporting tissues of the teeth, which is caused by specific microorganisms living in a biofilm, and and around the teeth. Microorganisms can trigger an immune response, in some cases resulting in the progressive destruction of gingival tissue, the periodontal ligament and alveolar bone. Disease progression is characterised by increased pocket formation, recession, tooth mobility, and in some cases, the loss of teeth. Gum disease can cause a host of problems if not managed effectively, which is why Laser + Holistic dental uses a variety of techniques to encourage a hygienic and healthy oral environment. Laser assisted periodontal treatments have been documented in improving patient outcomes through superior disinfection and stimulating healing responses. Laser assisted periodontal treatments also can reduce systemic bacteraemic impacts potentially caused when bacteria spreads throughout the blood stream from a site of infection.2 In dentistry, issues can occur when immunocompromised patients elect to have procedures such as deep pocket scaling or a tooth extraction. Laser + Holistic Dental combines laser, PAD and ozone technology to reduce these potential risks of infection and prevent disease for our patients. If you suffer from any symptoms linked to periodontal disease we recommend that you are tested for the genetic predisposition. This will allow our dentists to manage your risk profile and make sure we do everything possible to help you maintain a healthy oral environment. This also includes checking other family members who may have inherited the same genetic vulnerabilities. The earlier this is identified and appropriately managed will determine more favourable long term outcomes. This genetic testing can be simply done using painless saliva diagnostics. These tests can identify the DNA of various microorganisms and detect certain viruses, such as HPV which has been linked to oropharyngeal cancers. You can learn more about these genetic tests, and how they will assist in making evidence based choices for you and your family – please click here.